I have an abundance of dandelions at the moment. It's not at all a problem in my eyes but an opportunity to get creative and have some fun. 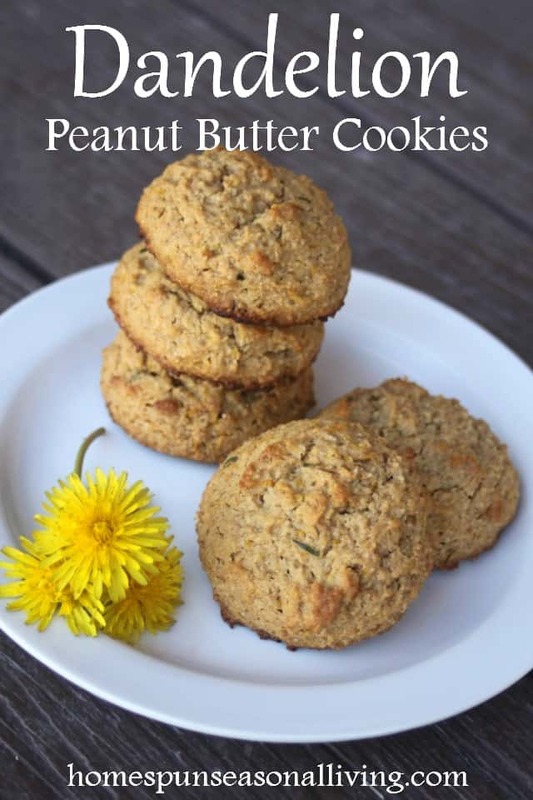 These Dandelion Peanut Butter Cookies are soft and full of flavor while also making for a slightly more nutritious cookie than the usual white sugar, white flour fare. Well, why not? They're everywhere in the spring, free, nutritious, and super tasty. Dandelion petals have a faint honey-like flavor which is bumped up in these cookies by using honey as the sweetener. Peanut butter and honey have long been a favorite flavor combination of mine and it does work delightfully well in these cookies. 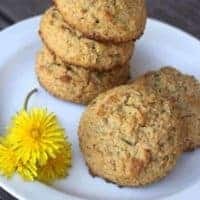 A mix of white and whole wheat flours give this cookie a lightness and a full bodied earthy flavor that pairs well the delicate and herbal flavor of the dandelions. Make sure to wash the dandelion flowers well. It can can get gritty between the petals and little bugs like to hide in there. Neither is likely to kill anyone but they might not be the most pleasant finds, either. For these cookies, you'll want to snip the petals from the flower. It's okay to get a few bits of green in the cookies, but mostly we're after the yellow petals for optimum flavor. Too much green stuff and the cookies might take on a bitter flavor. Admittedly, this takes a little bit of time it doesn't happen in 2 minutes but it is worth it. I measured about ½ cup of petals loosely packed which equated ⅜ of an ounce by weight – a little more, a little less isn't going to make or break these cookies. 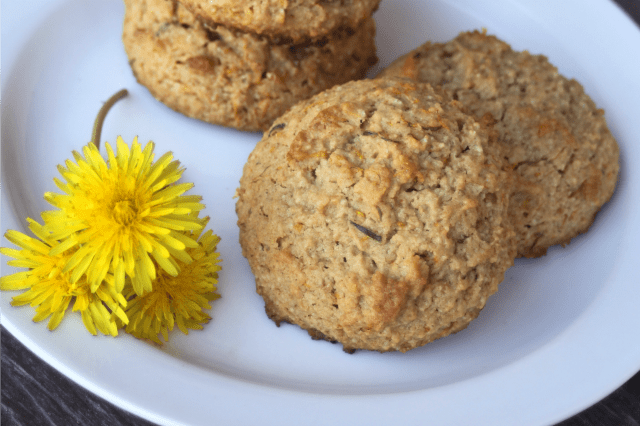 Harvest and use some dandelion petals for their honey-like flavor in these tasty and slightly nutritious Dandelion Peanut Butter Cookies. Preheat oven to 400 degrees. Line cookie sheets with parchment paper or silicone baking mats. Sift together the flours and baking soda. Set aside. Cream together the butter, peanut butter, and honey until light and fluffy. Beat in the egg and vanilla extract until thoroughly incorporated. Add the sifted dry ingredients to the butter mixture and mix until a soft dough forms. Fold in the dandelion petals. Drop by Tablespoons full onto prepared baking sheet. Bake in preheated oven for 13 to 15 minutes or until edges are golden. Makes 2 dozen when using a #40 cookie scoop - admittedly that's a large cookie. I’m loving these “foraged” recipes you’ve been sharing lately! I can’t wait to try these. Thanks so much! Let me know how they turn out for you. Excellent taste but they came out a little dry. So, we topped them with a little Rhubarb butter. Perhaps a little less flour in the future. Love the recipes. Yay for rhubarb butter. Bugger that they came out dry for you. You think it’s flour not cooking time? I wonder if it’s a difference in flour, I grind my own whole wheat… Hmmm. Thanks for letting me know. These taste delicious and are not too sweet. Mine remained in balls and did not spread out into nice circles like yours, but they’re still very good. I’m so glad to know that you liked them!